The Pars end their pre season warm up with another home defeat losing to Championship side West Brom 1-0.Hardly an inspiring start to the new season. The Pars ended their pre season warm up games with a tough encounter with West Bromwich Albion. The end result was a narrow but comfortable 1-0 win for the visitors but it must surely have left Jim Leishman none the wiser as to who will feature in his starting line up on Saturday against Hearts. It may have been 37 years since West Brom last visited East End Park but they surely enjoyed getting their revenge for the Pars famous victory at the Hawthorns in 1969. In front of a poor home crowd due to half of the county being away on holiday, do they not realise at the SPL, the height of summer is not the best time to be starting the league campaign? The Pars started with an unusual 3 5 2 line up with Roddy McKenzie looking resplendent in goal in his Dutch orange outfit. A back three of Scott Wilson, skipper Greg Shields and Souleymane Bamba listed as a trialist. In midfield Calum Woods was at right wing back, McGuire, Simmons and Mason in the middle with Iain Campbell on the left. Freddie Dacquin partnered another trialist up front in the shape of Noel Whelan. Freddie Dacquin was looking quite lively up front but would do a lot better if he gets a better first touch although the did show some prowess in the air winning a number of high balls which mostly found Whelan, who then tripped over the ball or beat himself. WBA were slow out of the blocked but won a corner in 4 minutes which allowed number 4 to shoot wide when virtually unmarked. There was a good start to the game by young Calum Wood at right back not least in 17 minutes when he made a strong challenge in midfield wining the ball but the wimp of a referee awarded a foul to the Baggies. One player who came in for some stick from the home crowd was former Celtic striker who certainly has not lost any weight over the close season. Yet despite looking very lazy and lethargic he could, and probably should, have scored a hat trick. As it was, in 19 minutes he headed wide which should have been a warning to Wilson and Co.
Freddie was trying his best at the other end with a good shot in 20 minutes then a few minutes later he put over a good cross from the left which Simmons just missed. These were the only half chances created by the Pars in the first half. 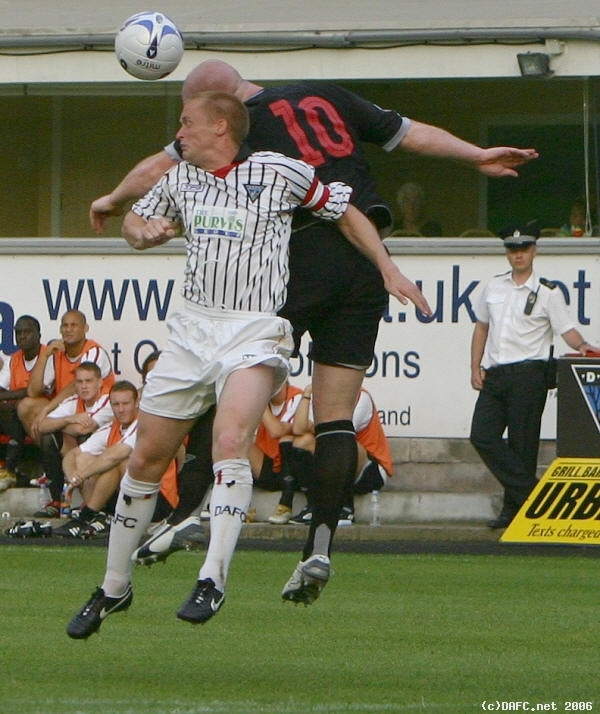 West Brom took a quick free kick in 38 minutes pushing the ball out to the left, Wood was caught out of position together with his defensive colleagues and the resulting cross was easily met by Hartson with a stooping header. It was a soft goal to lose. 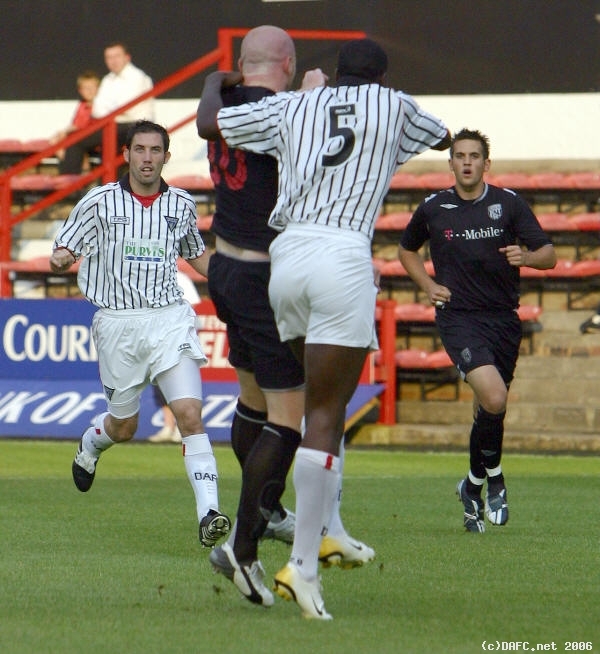 The Pars defence will come up against quicker players than Hartson which does not bode well. Half time 0-1. The Pars brought on young Nick Phinn at half time for Simmons who was no doubt injured again. Hartson headed over again just to remind everyone he was still on the park. Whelan was then replaced by another trialist, Keith Shevlin. Whelan was disappointing with his usual bustling style but poor control and obvious lack of fitness will surely end Jim Leishman’s interest in the player. West Brom were looking stronger and quicker as the Pars were being pushed back deep into heir own half. Hartson had yet another header which he glanced across the goal just wide of the far post. Bamba was more involved in the second half and looks composure personified to the point of almost being too casual. Iain Campbell was having a poor game yet came closest to finding an equaliser as he hit a free kick in 63 minutes off the underside of the bar. McKenzie made a good parried save from a Steve Watson shot. The former England international showed that despite advancing years he is still a very tidy player. Craig Wilson came of for Calum Woods in 65 minutes but it made little difference to the flow of the game. The Pars were completely lacking in creativity and any threat in the final third of the park. Bamba was crunched by Watson and Hartson in 72 minutes but he just picked himself up and got on with it. Owen Morrison replaced Dacquin in 73 minutes but the game just drifted out to the final whistle with no action of note at either end. Final score 0-1. The pluses for the Pars tonight were Bamba (second half but enough to earn the DAFC.Net MOM), Wood (first half) and McGuire (first half). The Pars will have to learn very quickly that they have to play for 90 minutes otherwise they will justify the pundits predictions as being favourites for relegation. There was simply nothing going forward and as long as they have Gary Mason in midfield they will get over run in that area as well, simply too slow and too lightweight and when he does pass he does so sideways or more likely backwards. There was no-one on the field tonight apart from Freddie capable of taking on an opponent or indeed showing the desire to take someone on.